GAZA CITY, Gaza Strip -- A Palestinian farmer was killed by an Israeli tank shell in the Gaza Strip early on Friday, hours before Palestinians staged mass protests along the border with Israel, a health official and a witness said. Ahead of the protests, called for by Gaza's militant Hamas rulers, Israel's military said it doubled its standard troop level along the border, deploying snipers, special forces and paramilitary border police units, which specialize in riot control. 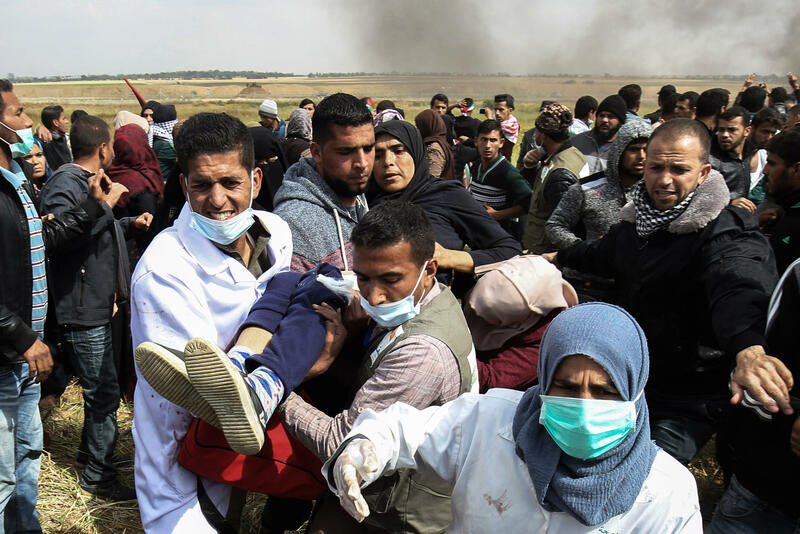 Large crowds of flag-waving Palestinian protesters marched toward the Gaza border fence later on Friday, some of them throwing stones and drawing Israeli fire that officials said killed at least six people. It was the deadliest day in Gaza in several months. Hamas had said that Friday's activities would be peaceful and the chief Israeli military spokesman, Brig. Gen. Ronen Manelis, said Israel wanted to avoid violence, but made it clear the military will not allow the crowds to breach the fence on Friday or damage military infrastructure. The Palestinian Health Ministry said at least 550 Palestinians were hurt by live fire, rubber-coated steel pellets or tear gas fired by Israeli forces at several locations along the fence, but did not provide the breakdown. The protests marked the launch of what Gaza's Hamas rulers envision as a 6-week-long campaign of mass sit-ins along the border, meant to spotlight the demand of uprooted Palestinians and their descendants to return to what is now Israel. It's also seen as a new attempt by Hamas to break a crippling, decade-old Gaza border blockade by Israel and Egypt that has made it increasingly difficult for the Islamic militant group to govern. Other tactics over the years, including cross-border wars with Israel and attempts to reconcile with political rival Mahmoud Abbas, the West Bank-based Palestinian president, have failed to end Gaza's isolation. Israel's military released a statement Friday morning saying thousands of Palestinians were "rioting in six locations throughout the Gaza Strip, rolling burning tires and hurling stones at the security fence and at IDF troops, who are responding with riot dispersal means and firing towards main instigators." The IDF (Israel Defense Forces) said Hamas was singularly "responsible for the violent riots and everything taking places under its auspices." In the planned protest, Palestinians are setting up tent camps along the border, the first of a series of actions planned in Gaza in the coming weeks. The activities are to culminate on May 15, the 70th anniversary of Israel's creation, with a march through the border fence. The Palestinian killed Friday was identified as 27-year-old Amr Samour. The Palestinian Health Ministry said he was struck by an Israeli tank shell in the southeastern corner of Gaza. The Israeli military said troops directed tank fire toward two suspects who approached the fence along the southern Gaza Strip and acted suspiciously. It said it is aware of reports of a killed Palestinian.